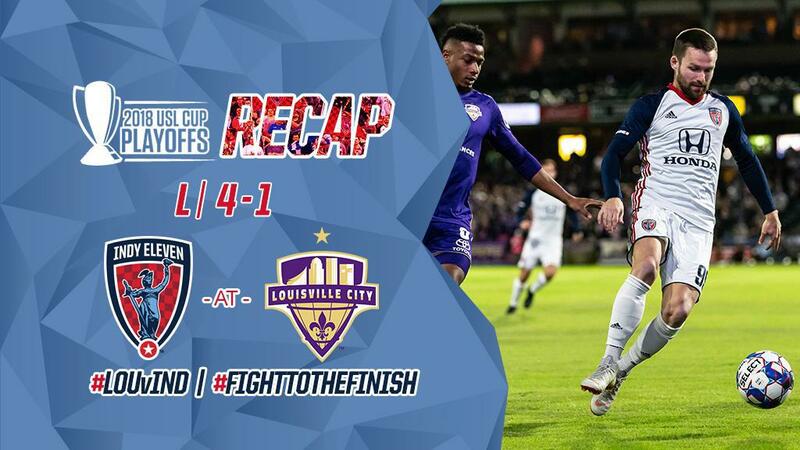 Indy Eleven’s 2018 USL Cup run came to an end after a 4-1 quarterfinal loss to Louisville City FC. A lone goal from Soony Saad wasn’t enough to fend off a brace from Louisville City’s Niall McCabe, and goals from Cameron Lancaster and Ilija Iliac in the last Louisville-Indianapolis Proximity Association Football Contest of 2018. Indy Eleven came out the gate with the first shot on goal in the opening 20 seconds of the match. A right footed shot from outside the box by Jack McInerney rocketed towards the goal and tested Greg Ranjitsingh’s ability to stop the attempt. “Boys in Blue” Midfielder Nico Matern tried his hand at goal in the fourth minute with a strike at the top of the box that sent Ranjitsingh lunging for a save, but the shot ended slightly above the crossbar. Louisville City flipped the script with shots on frame in the fifth and ninth minutes from Lancaster. The USL Golden Boot recipient’s attempts weren’t enough to slip past Eleven Goalkeeper Owain Fon Williams. The Welshman tallied his third save in the 28th minute after LCFC’s Brian Ownby’s cross connected with teammate George Davis IV inside Indy’s 18-yard box. The one-touch volley met with Fon Williams’ palms has he pushed the shot out of bounds. The 31-year-old keeper managed six saves on the evening. Despite Fon Williams’ strong outing, Louisville City found the lead in the 29th minute. A long, low cross from the corner by Oscar Jimenez found the feet of McCabe inside Indy’s penalty area. McCabe’s shot ricocheted off a few Eleven defender before slipping through Fon Williams’ grasp. The Kentucky based side doubled its lead in the 42nd minute. Davis IV volleyed the ball over Eleven Defender Carlyle Mitchell. Iliac managed to settle the pass near the top of the six-yard box for a low shot into the lower left corner of the net. Louisville City furthered the scoring gap three minutes into the second half. A set piece play from Jimenez opened McCabe up for a shot at the top Indy’s 18-yard box. The strike dropped through Indy’s defensive line and into the bottom left corner of the net. “Indiana’s Team’s” continued fight through the cold, windy conditions paid off with a goal from substitute forward Soony Saad in the 67th minute. A forward flick from Dylan Mares split though four LCFC players and found Saad as he ran into the home side’s penalty box. Saad, who missed the previous fixture due to international duty, marched forward for a shot into the lower left corner of the goal. Indy’s excitement was short-lived as Louisville City FC responded in the 73rd minute. Lancaster notched his first 2018 playoff goal with a curling free kick from distance that snuck around Fon Williams. The loss brings an end to Indy Eleven’s first playoff run since 2016 and its first under Indy Eleven Head Coach Martin Rennie. Though the loss is tough, Rennie sets his sights on 2019. Saturday, October 20, 2018 – 7:30 p.m.